Low Oil Pressure and Auxiliary Shutdown inputs Aux can be used for irrigation pressure etc. Automatic Bypass when Starting Allows pressures to stabilize before protection circuit starts. Bypass (blinking) - Indicates all protection circuits are over-ridden and the TM5 will not stop the engine. Output On - Indicates the Yellow control output wire has voltage. Hours Display - When this light is ON the main display is indicating the hours remaining before the timer stops the engine. Minutes Display - When this light is ON the main display is indicating the minutes remaining before the timer stops the engine. Oil Low - Indicates the engines oil pressure is low, this is a fault condition. Aux Fault – Indicates the black Auxiliary wire is in a fault condition. Temp High - Indicates the current engine temperature is higher then the temperature set in the alarm, this is a fault condition (this function needs to be set for individual engines). 1. 48 HR RUN TIMER. The timer can be programmed to stop the engine from 1 minute to 48 hours. When first turned on, the display will show 000 and the red ‘Hours display’ and green ‘Minutes display’ lights will be slowly toggling on and off (red long and green short). When the red ‘Hours Display’ light is on, the display shows the hours remaining before the engine shuts down. When the green ‘Minutes Display’ light is on, the display is showing the minutes remaining before the engine shuts down. The timer is off when the display is 000 on both red and green lights. TO SET THE 48 Hr RUN TIMER. To activate this feature a time must be programmed into it. Always set the HOURS first and then the MINUTES second. To set the HOURS, wait until the red ‘Hours Display’ light is on and press the ‘HOUR SET’ switch. Release the ‘HOUR SET’ switch when you get to the desired number of hours. To set the MINUTES, wait until the green ‘Minutes Display’ light is on and press the ‘MINUTE SET’ switch. The timer starts as soon as the switches are released. Example, if the display is programmed to indicate 002 with the red ‘Hours Display’ light on and 030 with the green ’Minutes Display’ light on, the engine will stop in 2hr 30m. 2. OVER TEMPERATURE SHUTDOWN ALARM. Factory set at 100 C, Reset to suit individual engines. DISPLAYING THE CURRENT ENGINE TEMPERATURE. To display the current engine temperature, press the top right hand switch down to ‘TEMPERATURE’. The current engine temperature will display as long as this switch is held down. Once this switch is released the display will return to the Run Timer. DISPLAYING THE ALARM TEMPERATURE. (Displays the temperature the engine will shutdown at). Turn the ignition switch to RUN, do not start the engine. Press and hold down the top right hand switch marked ‘TEMPERATURE’ and then start the TM5 manually using the ‘Start/ Bypass’ switch. The alarm temperature will momentarily display before showing the current engine temperature. TO SET THE OVER TEMPERATURE SHUTDOWN ALARM. If the engine is running, first activate the one minute bypass by momentarily pressing the ‘Start / Bypass’ switch. Press & Hold down the top right hand switch marked ‘TEMPERATURE’ (The current Temperature will display). While holding down the ‘TEMPERATURE’ switch, press the ‘TEMP & SERVICE SET’ switch at the same time. (The alarm temperature will display and then start scrolling forward up to 127 before starting back at 1). Release the ‘TEMP & SERVICE SET’ switch when you reach the desired alarm temperature. NOTE - If altering the alarm while the engine is running, ensure the bypass is on to prevent the alarm inadvertently stopping the engine. DISPLAYING THE HOURS SINCE THE ENGINE WAS LAST SERVICED. To display the hours the engine has run since its last service, press and hold down the ‘Hours since last Service’ switch. Once this switch is released the display will return to displaying the Run Timer. Firstly press and hold down the ‘Hours since last Service’ switch. While holding down the ‘Hours since last Service’ switch, press the ‘TEMP & SERVICE SET’ switch down until the time in the memory indicates and then quickly release it within 2 seconds. Having noted the memory time, release the ‘Hours since last service’ switch. TO RESET THE SERVICE COUNTER & TURN OFF THE ‘SERVICE ALARM’ LIGHT. The service alarm light can be set to come on in fifty hour increments from 50 to 500 hours. Turn the TM5 on manually using the ‘Start/Bypass’ switch, without starting the engine. While holding down the ‘Hour since last Service’ switch, press the ‘TEMP & SERVICE SET’ switch at the same time (The display will now show the hours between services & start scrolling forward by 50s every 2 sec). Hold both switches down until the display has scrolled up to 500 and then back to 50, then go forward to the number of hours you require before the next service. (When the alarm memory scrolls from 500 back to 50, the counter resets back to zero and the ‘Service Alarm’ light turns off). Release the ‘TEMP & SERVICE SET’ switch when reaching the hours you require before the next service. The counter will go back to 000. Release the ‘Hours since last Services’ switch. Turn the TM5 off for at least 10 seconds before restarting the unit and the engine. NOTE The service timer continues to count as long as the TM5 is powered and unless manually reset, it will count on to 900 HOURS before automatically resetting. When the ‘Service Alarm’ light indicates, the engine is due for service. 4. Low Oil Pressure and Auxiliary Shutdown inputs These inputs must be pulled to ground in order to stop the engine. The Auxiliary input can be used for any purpose eg, irrigation pressure, float value etc. 5. Automatic Bypass when Starting The TM5 automatically gives 1 minute of bypass time after starting; this allows pressures to stabilize before the protection circuit starts. Pressing the button before the 1 minute is up will give another 1 minute of bypass time. 6. 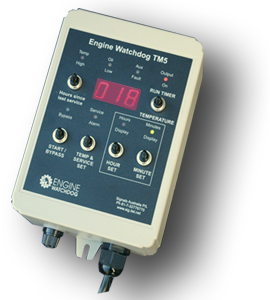 Compatible with Fuel or Stopping Solenoids & Relays The TM5 has two field selectable outputs that cover most situations. Using the installation diagram select the Yellow wire output that suits your needs. The TM5 comes from the factory in mode A. For mode B, cut the thin black loop at the cable entry. 7. Automatic Battery Isolation Option This feature uses the 12V relay supplied to isolates the battery after engine shutdown and is ideal for remote locations. If the 20A relay is not large enough, use a larger slave relay.